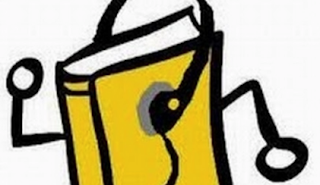 Library Links: Audiobooks: Is listening as good as reading? Audiobooks: Is listening as good as reading? Do you need the text in front of you? "In a 2012 New Yorker essay, author and journalist John Colapinto added to the debate, noting that the oral tradition may have developed along with human language. Humanity's long history of storytelling -- which predates written language by tens of thousands of years -- supports the argument that our brains originally adapted to absorb long, complex fictions not by eye, but by ear, he said. [...] University of Virginia psychology professor Dan Willingham said research that breaks down how people learn to process written language suggests that once people master reading, their comprehension is the same, whether they are absorbing printed or narrated texts. "